The December 1 theme on Sophistique Noir is Maxi Skirts. 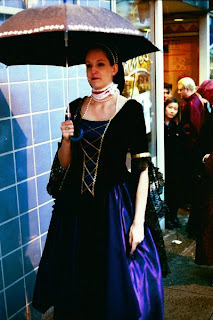 My first forays into goth fashion were in the tradgoth, romantigoth and similar styles, and I wore long skirts frequently. I pulled a couple from the depths of my closet to feature here. But first, let's look at the practical side of maxi skirts - warmth! Maxi skirts are great in the winter because you can pile on layers underneath for warmth. Of course, if you've spent more than five minutes on my blog, you've heard me complaining that I get hot too easily (particularly at work, where my office is holding steady at about 80F every day). Nonetheless, I do have an idea to share: bloomers made of flannel-back satin. Satin is great for bloomers because your skirt will slide freely over them, not get bunched or twisted, and the flannel side will keep you toasty warm! Bloomers are not hard to sew. Bloomer patterns are available; you can also modify a pant pattern by cutting it shorter and adding elastic to the bottom. Elastic-waist pants are often included in sportswear patterns, which will also give you other pieces such as a jacket or dress. And now, let's look at two maxi skirts from deep within my closet! 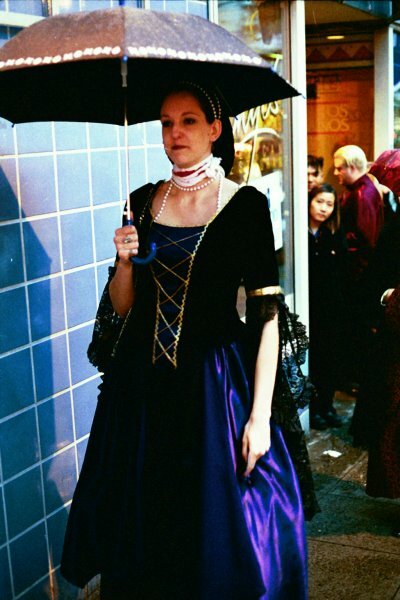 My mom made this black and silver velvet skirt for me many years ago when I was first discovering goth fashion. She lengthened it significantly so it would be ankle length. She deserves extra credit for that task - with the swirly seams, it must have been a challenge! I wore this skirt so many times that it began to stretch out and hang wonky. It no longer fits me well (darn hips), so a hanger photo will have to suffice. Someday, I will replicate this skirt. I don't know what pattern Mom used; I'm sure it's long out of print. 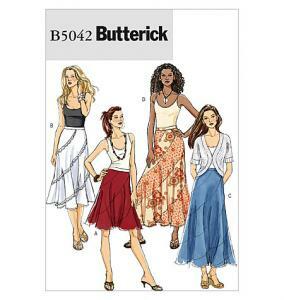 I have two similar patterns in my stash - Butterick 5042, which I just discovered is out of print :( and Simplicity 2416, which has a similar swirl style and is currently available. Here's another skirt Mom made me. It's purple satin with a black lace overlay and additional purple "wings" on the sides. As usual, my camera refuses to photograph purple properly and does no justice to this beautiful skirt. You look awesome in that photo! Aaaah, Peter Murphy in Seattle - perfection! Wow that black and purple skirt is so pretty! Yeah, I guess so. :) I grew up watching Mom sew, and eventually I began teaching myself. I still have a long way to go before I master the difficult fabrics like satin and velvet as well as Mom! Those swirl patterns looks fabulous I'm sure you will do something lovely with theese. The purple skirt is so nice. Lovely to see you in this outfit. Your mom rocks!!! You really must recreate that silver and black skirt. It's so gorgeous!! Great suggestions about the bloomers - I love the flannel-backed satin idea and using an elastic waist pant pattern. The last dress your wearing that your mother sewed for you, it looks a lot like a dress pattern I saw its a simplicity 8750. Maybe that's the pattern she used? Could be. Simplicity 8750 certainly looks like it. i actually have this pattern ... maybe one day I will use it.. to many projects not enough time.. I love what your monther did with it though.. very beautiful.. Indeed! That pattern is essentially the same. awesome! My head is always full of useless information, when I saw that pattern I remembered this blog and thought it was a close match for the one skirt your mother made! If you decide to make it I would love to see the final result. Would you make one in the same colors like the one your mother made? Or would you do something different?